Last month, I was asked by the Sustainability office of the City of Austin to write a White Paper on what I call the Unified Energy System. So here is my latest try at depicting the kind of energy system we need to adopt if we are to move forward with a low carbon world. I also want to thank Lucia Athens and her staff for making my writing better. Writers always need editing, no matter how much we may think we don't. In today’s energy environment, there is a growing need and expectation that our energy systems must become more and more carbon-free. And indeed, renewables are gaining larger shares of the energy pie. Last year alone, over 70 gigawatts of wind and solar were installed globally. Where a goal of 35% renewable energy seemed aggressive just a few years ago, new goals of 55% to 60% are now becoming the new markers of progressive energy policy. Such is the case in Austin, Texas. However, in order to reach even higher percentages, we need to rethink the current system. In today's world, the stationary energy grid is our electric system. And in this system, large utilities produce and sell energy to their customers in the form of kilowatt-hours. And in the world of transportation, almost all energy comes from oil. Sure, there are electric subways and the like, but most of the energy comes from oil. In a Unified Energy Grid, utilities still sell their product to customers, but customers also sell product back to the utility. Instead of the transportation industry running exclusively on oil, it begins to slowly become transformed by electric cars and other transportation appliances that connect not only to the utility, but also to dwellings that are also energy producers. And as the future arrives, those electric-powered vehicles will be able to provide energy and voltage support to the utility on the occasional peak load demand day. Moreover, larger plug-in vehicles with on-board generators can provide critical support and community resilience in times of unplanned outages. This triangle of generation, load, and transportation, each feeding and supporting each other, is then encompassed within a sphere of intelligence, the Smart Grid. A Unified Energy System is made complete with smart roads, smart buildings with smart appliances, and networked smart transportation options. 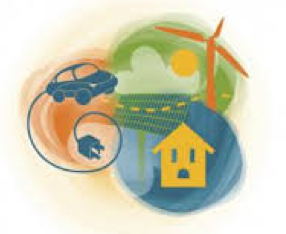 Energy needs to flow in this new unified system from the increasingly green utility to the house and to the car. Energy also needs to flow from the house to the car. And energy must flow in the other direction as well, from the car to the house (if the house is off the grid), from the car to the utility, and from the house to the utility. With an integrated, unified energy system, we would no longer have the waste that exists at a typical football stadium parking lot where more generation capacity sits idle on the pavement outside the stadium than exists in the whole community's electrical generation portfolio. With plug-in hybrids and other electric transportation appliances, that capacity would no longer be stranded. A decade ago, these ideas were considered to be outside the bell curve of accepted public policy. That was before John Wellinghoff, former head of the Federal Energy Regulatory Commission (FERC). While he never used the term Unified Energy System, he preached it. During his tenure as the longest serving chair of the FERC, Wellinghoff worked to make the U.S. power grid cleaner and more efficient, by integrating emerging resources such as renewable energy and demand response, and including energy efficiency and local storage systems such as those in plug-in hybrid and all electric vehicles. He championed the agency’s landmark Order 1000, which required grid planners and public utilities to coordinate regional power line projects and encouraged the integration of solar and wind installations. That is exactly what Texas did in building the CREZ lines in the western part of the state. And it was before Elon Musk of Tesla began to actualize his vision. According to Lyndon Rive, Elon Musk’s cousin and CEO of Solar City, "Thanks to the economies of scale that will come from Tesla's gigafactory, within 10 years every solar system that SolarCity sells will come with a battery-storage system, and it will still produce energy cheaper than what is available from the local utility company." And its embodiment will be a Unified Energy System. In the same manner that hydropower in the northwest United States powers southern California through DC intertie, wind fields in the Texas Panhandle may soon help meet peak demand in Phoenix, even as solar fields east of El Paso provide peak power to Dallas, Houston, and Austin. As we sleep, the great nighttime winds of the Llano Estacado will charge our cars for the next day’s urban commute. After we commute to work, these same cars will take on excess early morning solar power from local rooftops that will then be repurchased by the system operator in the afternoon at premium prices. Through this unification of effort and design, humankind will not only meet the great challenges that face us, we will create a better and more resilient world. Michael Osborne is the former Special Assistant to the General Manager for Energy Development at Austin Energy. He served as Chairman of the Austin City Council appointed Generation Resource Planning Task Force, which resulted in an adopted plan that will bring the nation’s 8th largest public power utility and the 11th largest city to 55% renewable energy. Mr. Osborne is an author, inventor, and policy maker. He has served on the steering committees of the Texas Energy Policy Partnership and the Sustainable Energy Development Council under Governor Ann Richards, and on the Texas Energy Coordination Council appointed by then Governor George Bush. As one of three founding members of the Texas Renewable Energy Industries Association, he has been at the forefront in making Texas the leading renewable energy state in the United States.